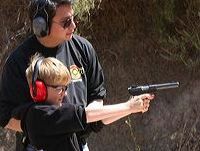 This course is designed for our youth to acquire basic firearm safety and knowledge on pistols and rifles. Each adult may bring up to 2 children (17 and below) at a discounted price. The class will cover basic fundamentals and marksmanship. Students will experience live shooting exercises at the range and be able to test their shooting skills. All equipment, including firearms and ammunition will be provided. Must be physically and emotionally ready to participate in firearm training as determined by their parents/guardians. This course is conducted by professional firearms instructors, NRA certified with expertise in various types of firearms and disciplines. You may also rent one from the range if you prefer specific rifle brand.